A. if I drag or copy/cut and paste a node from incoming to my newpaper.mindmap, it comes with Author - Year - Title and is added as a new node, which results in long node titles. B. If I drag from the reference manager, the cursor shows a link sign (little curved arrow) if hovered over an existing node. This node is coloured at the top or at one side as if the new dragged reference would be added either as a new sibling or new child. 1. there is no new node added, instead the attributes of the existing nodee are overwritten with the new reference metadata - and without any warning. 2. there is no node title, it is just empty. This behaviour is inconsistent and therefore irritating. a dragging/adding a new reference should always add a new node. If overwriting is really important, an additional key (shift, alt, ...) could be pressed while dragging. b if a node is created by dragging a reference it should always give a node title, irrespective if it is dragged from another mindmap or from the reference manager. a and b are a necessity imho, c would be a very convenient feature. It's different because you do different things. For A you copy a mind map node to a different location. This should result in the exactly same object. What you can do however is to define different view attributes. For B you drag & drop a reference or a PDF file to an existing mind map node which will result in that node linking to the reference and/or the PDF file. If you have any more questions, please let us know or refer to our FAQ or Manual. yes, I understand that this are different actions - the question is however: should they be different, and for what reason? So, what is the reason to make a difference between a copied node (which is a copy of a node which is linked to a ref and a pdf) and a node which links directly to the reference and the pdf-file? In the end I get the same functionality, right? If you drag & drop the small PDF icon from JabRef's reference table to the mind map, a sub node will be created with the file's name as node text. If you drag any other part to the mind map (i.e. the reference itself) the reference will be directly attached to the target node. You will end up with a rather long table showing only different icons but no information about any new information one has marked in the PDF files. In the "Incoming" / "Literature & Annotations" map you will directly see what's new. If its a lot of information you can hide annotations you don't want to see by closing all sub nodes of the PDF nodes (nodes with the PDF file name and parents of the nodes containing the specific annotations). the node will contain all annotations of the PDF file instead of only new annotations (i.e. 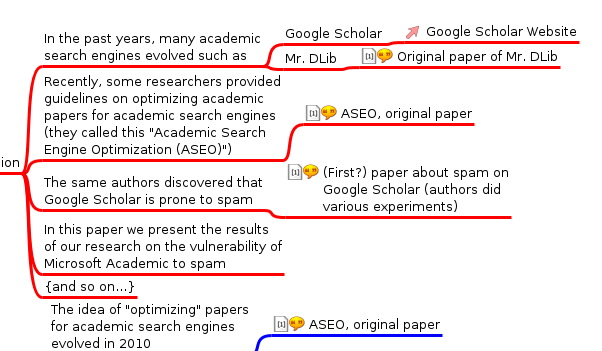 annotations not already organized in your mind map). But it's a basic feature of Docear that the incoming folder only shows annotations you have not already organized. With this approach you can easily track what's really new. 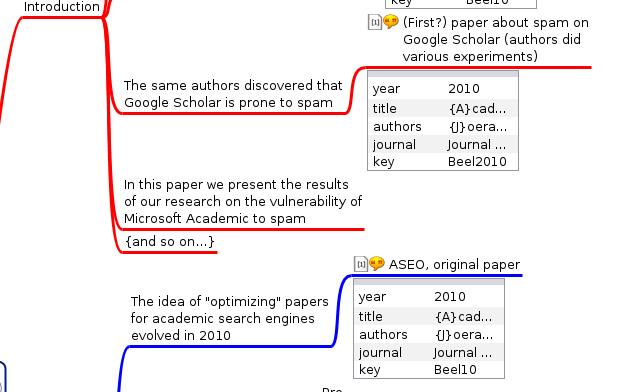 I guess we could additionally mark the references containing unused annotations when we replace the current version of JabRef used in Docear with the new one. However, this is a big task and we won't be able to work on this in the next weeks.